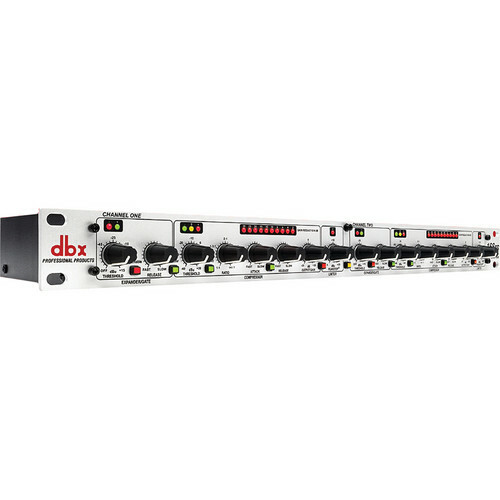 The 166xs from dbx is a dual-channel compressor/gate/limiter that when added to a live sound rig or studio, will deliver more polished, professional sound. The unit can function either as a stereo processor or in dual mono mode and features all the usual controls required for this kind of processor. For simplified operation the 166xs features Overeasy compression technology for smooth and musical performance, while the exclusive AutoDynamic attack and release controls puts great sound within easy reach. The processor has true RMS power summing and features quality input and output connectors. Comprehensive visual feedback is provided by gain reduction metering and backlit switches. Box Dimensions (LxWxH) 21.8 x 11.3 x 2.5"
166xs - Compressor/Limiter/Gate is rated 4.8 out of 5 by 8. Rated 5 out of 5 by Anonymous from Great Compressor!! I bought this compressor off B&H because it was $100 cheaper on here than going through the DBX website. So not only did I get a great product, I got it at a great price. 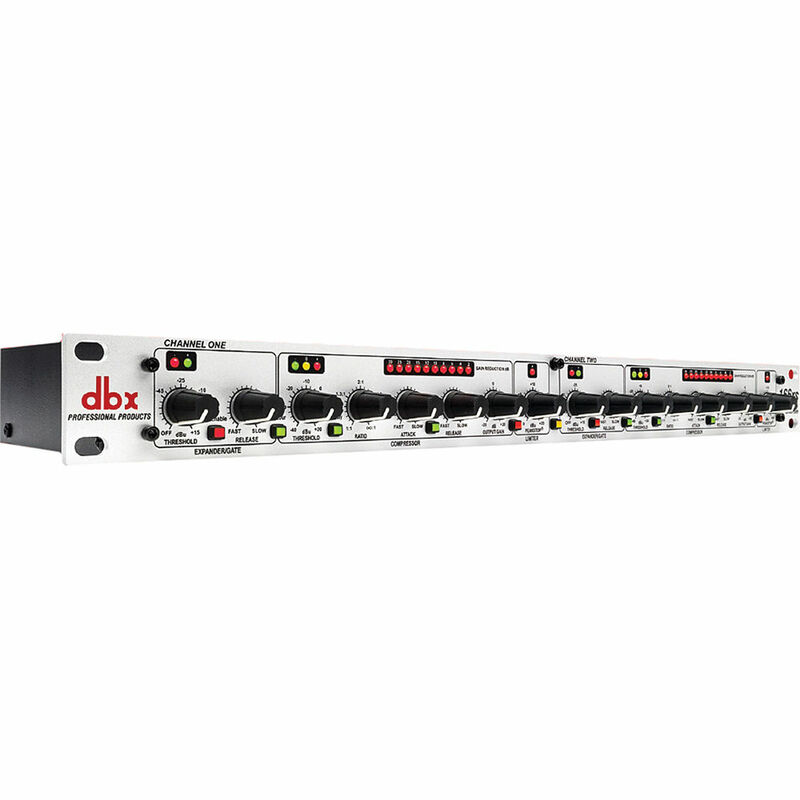 DBX really know's how to make a good product. I'm using this compressor for a small home studio where I wanted to have vocals and guitar go into the mix already compressed. This is going to sound funny, but the thing that I like the most about it is that the knobs click when you turn them, so if you accidentally brush by the knobs, they won't turn without you knowing. It sounds so minimal but its an awesome feature. Rated 5 out of 5 by Anonymous from High quality but strong compression My previous compressors were an Alesis 3630, a DIY compressor, and software compressors. This compressor has excellent sound quality overall. The peak-stop limiter is really a soft clipper -- you can use it for distortion (sounds great), but I am not sure it is good for anything else. I use this compressor for recording only. You have to be careful with the settings, or you wind up with compression side effects. It is a strong compressor. Each LED on the gain reduction meter represents 2 dB; I did not notice this at first, as I was used to 1 dB resolution, so I applied too much compression. The attack control, as well as release, if set too fast, will make the compression more obvious. For smooth compression, both the attack and release must be set fairly slow, or use the auto button. For electric guitar, I am using the attack at 8 o'clock and release at 3 o'clock. I prefer the over-easy mode, which is soft-knee. The contour button is a high pass filter on the compression control signal only (not on the output), to prevent excessive compression when your signal contains a lot of low frequencies. I always have contour enabled. When adjusted correctly, it is a smooth, nearly transparent compressor, perfect for reducing dynamic range by a few dB when recording. It has many other uses, but that is all I use it for. The expander (similar to a gate) works, but it is more twitchy than I expected. You must adjust it for each signal. If you have it set slightly off, it will jump back and forth between open a closed. I only use it for noisy distorted guitars. It works well, as long as I remember to tweak it every time. I keep the release slow on this. There are many settings. As long as you take your time to learn how to use compression in general, you can probably find the compression sound you are looking for, unless you are looking for the sound of a non-VCA type compressor. Compression does take time to learn. You should start with smaller amounts of compression. The amount of compression you can apply is quite amazing. You can squash the signal completely flat if you want. The main thing I don't like is the lack of an on-off button. Other than that, it is perfect for me. Rated 5 out of 5 by Dylan Eggs from Good piece of equipment. I got it out of the box, plugged it, and started using it right away. It wasn't hard to figure out and it did its job perfectly. The noise gate was actually pretty nice. I was expecting this feature to lack in quality but it does a well enough job that I don't plan to buy an actual gate for my rack. This website had the cheapest price for this item and I would definitely recommend buying the dbx166xs if you're looking for a compressor. Rated 4 out of 5 by Tekbench from Classic Affordable Compressor A solid, link-able two channel analog compressor. Works great as a clean, pre-processor in broadcasting to protect the front end of an STL. Also useful to make on-air talent headphones sound good. Either in-ear or amplified. Rated 5 out of 5 by Brad from Does exactly as advertised and as needed I use the compressor/limiter/gate for a couple of purposes. Voice over work for clean recordings and live singer/guitar performances. The gate gives me perfect response for the voice recording, and for live performances, allows good ring out for guitar when needed. Compressor/limiter features includes pre-sets work well for several situations. Responsive LEDs, dials that feel good, and looks great in the rack. Rated 5 out of 5 by Chris from i would buy this again! super product for the price! no problems! Rated 4 out of 5 by Thomas from Perfect replacement Replaced a many-years-old, failing dbx 1066 with the dbx 166XS and everything seems to be working perfectly.? Too early to tell about long term reliability.? BTW:? good owners manual. Rated 5 out of 5 by BWE from Good Product Love the flexibility of this compressor.